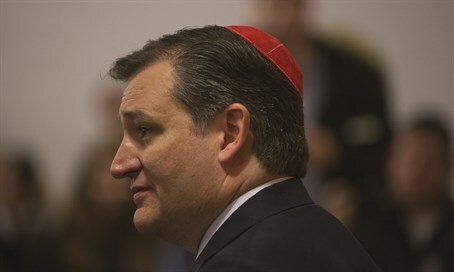 American Jews come away from Las Vegas event with more knowledge about Ted Cruz. LAS VEGAS (JTA) – Ted Cruz came here to woo Republican Jews over the weekend, and in the absence of his opponents for the GOP presidential nomination came away with qualified support based not on who he is but who he is not -- Donald Trump. Trump and Ohio Gov. John Kasich skipped the spring meeting of the Republican Jewish Coalition, leaving Cruz as the sole hopeful to address the 560 Jews packed into a conference room at The Venetian casino resort. Trump’s high negative approval ratings among women and minorities coupled with his seeming fecklessness on Israel -- pledging neutrality one week and support the next -- seemed to drive many in attendance to give Cruz a second look after months of shunning the Texas senator for his social conservatism and reputation for not making nice with other Republicans. “This is a room of dear, dear friends and people who are becoming dear friends,” Cruz said during his Saturday night address. No one questioned Cruz’s Israel bona fides, and his impassioned expressions of support for the country earned standing ovations, the longest when he swore to move the U.S. Embassy to Jerusalem. But his more important qualification was the possibility that he could beat Trump, whose candidacy, as folks whispered in conversations in the corridors, would lead inexorably to President Hillary Clinton. Trump had planned to attend the RJC event as part of a Western campaign trip, but the tour was canceled. Kasich, badly trailing Trump and Cruz, is working the corners of New York state hoping to garner enough delegates in its primary next week to make his remaining in the race seem less than absurd. “Senator Cruz was the only one to accept our invitation," Michael Epstein, a board member of the Republican Jewish Coalition, said in his introduction of the candidate. The room burst into grateful applause. Cruz addressed the hesitation, the fraught quality of this getting-to-know-you session. One of the more emotional moments came when Joel Geiderman, a Beverly Hills doctor and the child of a Holocaust survivor, refuted the TV pundits, including Geraldo Rivera, who said Cruz's derision of "New York values" was a dog-whistle to anti-Semites. “We don’t think you have an anti-Semitic bone in your body,” Geiderman said, stirring a standing ovation. There were also anxious, awkward questions about his social policies. “I recognize that is a question that many people here wrestle with,” Cruz said after one of the attendees earned applause for saying Cruz’s hard-line attitudes on abortion and gay marriage were unpopular with many Jewish Republicans. Cruz said social issues devolve to the states and suggested he would not seek to impose his views as a president. “Nobody wants to elect a hectoring scold," he said. Yet within minutes, he was hectoring, however politely. Wealthier Republicans needed to acknowledge the strong feelings of blue-collar voters who believe they are losing jobs to undocumented immigrants, Cruz said. “You want to understand the rage,” Cruz said. “That frustration, that anger – median income has not changed in 20 years” for the working class. He acknowledged that he would not win on a first vote at the convention. Cruz is working hard at it. He spent Friday at the RJC event meeting privately with fund-raisers. The reception was positive, said Nick Muzin, a senior adviser to the campaign. Cruz flew early Saturday to Colorado to work its Republican Party state convention, to productive effect -- he walked away with the state’s entire slate of pledged delegates. He flew back to Las Vegas in the afternoon. Rains drenching the city kept him circling the airport for an hour or so while the RJC activists paced the cavernous Venetian casino, owned by Sheldon Adelson, a major funder of the RJC and a Republican kingmaker. Cruz did not score the prized Adelson endorsement; the magnate left the RJC confab early for a wedding. In the halls, Jewish Republicans were more inclined to talk about whom they did not favor – Trump – than offer a glowing recommendation of Cruz. Bogdanoff thought a moment. “I’d like to see someone who would win,” she said in a tone suggesting she wanted Cruz to convince her. David Gilson, a lawyer from Arlington, Virginia, who backs Kasich, said conference-goers were not, at least, negative regarding Cruz. “I do hear cracks about Trump,” he said. One member explained his support for Trump -- "so far" -- in pragmatic terms. "There's no point in backing someone if he's not going to be elected in November," said David Pulver, a Florida businessman. “We haven’t focused on the failed presidency of Barack Obama or factored Hillary Clinton into it,” he said, worried that the momentum for such a narrative is slipping away. After Cruz spoke, many in the room appeared reassured. "Ted Cruz helped himself a lot at the Republican Jewish Coalition meeting," Ari Fleischer, an RJC board member and the first-term spokesman for President George W. Bush, said on Twitter. "He's going to leave here with a lot of support."